The EasyAzon Amazon WordPress plugin can be used to easily add Amazon product affiliates links from within your WordPress posts without having to login to the Amazon affiliate program website, search for relevant Amazon products, create the affiliate links and copy and paste them into your posts. EasyAzon isn’t a WordPress Amazon autoblog plugin like WP Robot (WP Robot creates WordPress posts using Amazon affiliate content), EasyAzon is a plugin to monetize your unique content by linking to relevant Amazon products with an affiliate link. In a nutshell, while creating or editing a post you click the EasyAzon button (it’s next the the Add Media button). A few clicks later and the Amazon affiliate ad link or image ad is part of your WordPress post as shortcode. EasyAzon is very easy to use unlike manually creating Amazon affiliate links. Text link: a text link, on the main options page there’s options to cloak the link and add a rel=”nofollow” attribute and add a hoverover Amazon affiliate ad. I really like the Amazon hoverover ad feature, think Infolinks or Kontera intext ads where you hoverover a text link and an ad pops up. 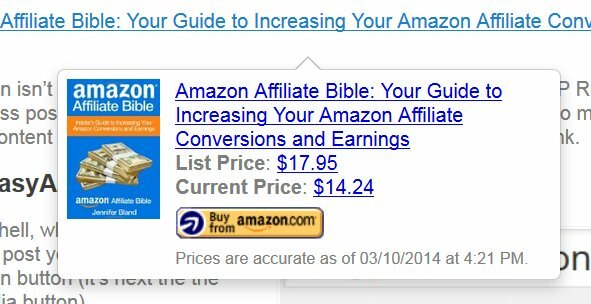 I searched for products related to “Amazon Affiliate” using EasyAzon and selected the “Amazon Affiliate Bible: Your Guide to Increasing Your Amazon Affiliate Conversions and Earnings” as a text link ad, below is what the hoverover ad looks like, pretty cool. Image Link: you have similar options to the text link ads, but it loads as an image, links to the Amazon product image. If you want a simple Amazon image affiliate link, this is your ad type. 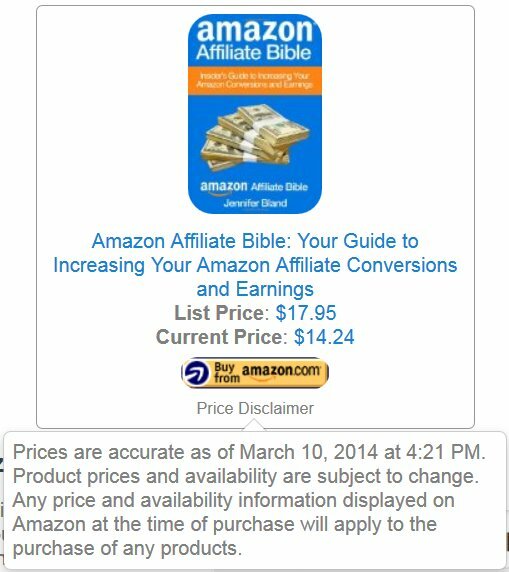 If you look at the image of the “Amazon Affiliate Bible” in the hover ad above and the Info Block ad below that’s the sort of images you can use, there’s 6 image sizes and alignments left, right and center. Info Block: I like this ad type, this loads an entire Amazon ad block not unlike a single product AdSense ad. As you can see from the screenshot below it includes a hoverover “Price Disclaimer”. I have some sites that I can’t run AdSense on might try replacing the AdSense ads with these types of Amazon ads. Call To Action: This adds an Amazon Buy Now button (choice of 6 buy now Amazon buttons). Useful for if you are writing a review of an Amazon product and want a Buy Now Button. 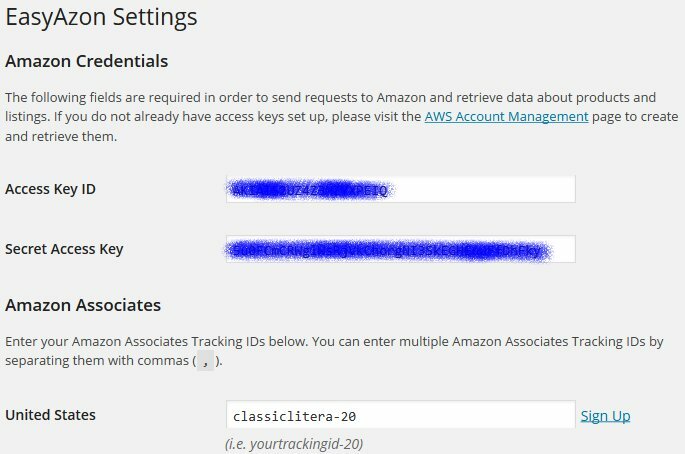 On the main plugin options page there’s boxes for adding your Amazon Credentials: Access Key ID, Secret Access Key and your Amazon Associates Tracking IDs for the following countries. United States, Canada, China, France, Germany, India, Italy, Japan, Spain and United Kingdom. Potential Extra Money Maker: Automatically change your Amazon affiliate links to match the country your website visitor is viewing your website from (applicable to the countries you’ve provided Tracking ID’s for in the EasyAzon Settings above). This feature can help you earn commissions on traffic that you would otherwise not get paid on. For example: You create an affiliate link for the Xbox One product where your default search locale as listed in the EasyAzon settings above is the United States. A visitor from the United Kingdom visits your website and clicks your affiliate link to the Xbox One. Instead of going to Amazon.com, they are taken to a product search results page for “Xbox One” on the Amazon.co.uk website where you can now receive a commission if that visitor buys a product from Amazon.co.uk. 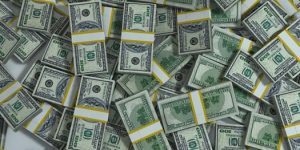 EasyAzon won’t generate extra traffic to your site so don’t expect an increase in visitors, what it does (and does well) is monetize your current traffic. As you can see from my Amazon Affiliate Payments Proof article in the past I’ve made a nice chunk of change from the Amazon affiliate program. I don’t think I’ll match that level of income as easily as in 2005, but given time and effort using EasyAzon on my sites that are poorly monetized it’s extra money for the time it takes to click the mouse a few times. If I can get my Amazon affiliate earnings back up to above $5,000 a year it will be worthwhile.